Nothing can be more personal than having a name or initials embroidered/monogrammed on that special gift or apparel item. 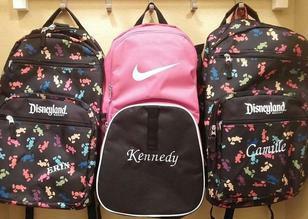 We offer a large selection of font styles and sizes that we will be glad to customize for your special needs. Stitched Bling can transform your company logo into a wearable advertisement for your business. Nothing looks more professional than having you and your employees dressed with your company logo embroidered on their uniform or apparel. There is a one time set-up / digitizing fee to create your logo / design from a .jpg or .pdf file. You will not be charged again for this service on future orders unless you make changes to the logo / design. All Logos/Designs >4" - Start at $ 50.00 and go up depending on the size of the design. Embroidery pricing is based on the number of stitches needed to sew your logo / design. 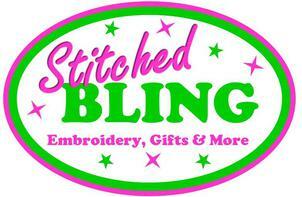 Stitched Bling charges $1.00 per 1,000 stitches, with a minimum fee of $10.00 per item. These size standards are to be used as guidelines only. Imprint size may vary per design, garment and location.